How do financial markets react to the dissolution of a sovereign state? Do dissolutions lead to sovereign defaults? Events in Scotland, Spain and the Ukraine underscore the importance of these questions. In the absence of recent case studies, historical studies can provide insight. A new EHES working paper studies the breakup of the United Kingdom (UK) of Great Britain and Ireland in 1922. Compiling daily historical data from the Dublin Stock Exchange, Nathan Foley-Fisher (Federal Reserve Board) and Eoin McLaughlin (Edinburgh) utilise a type of sovereign debt termed ‘Irish land bonds’. 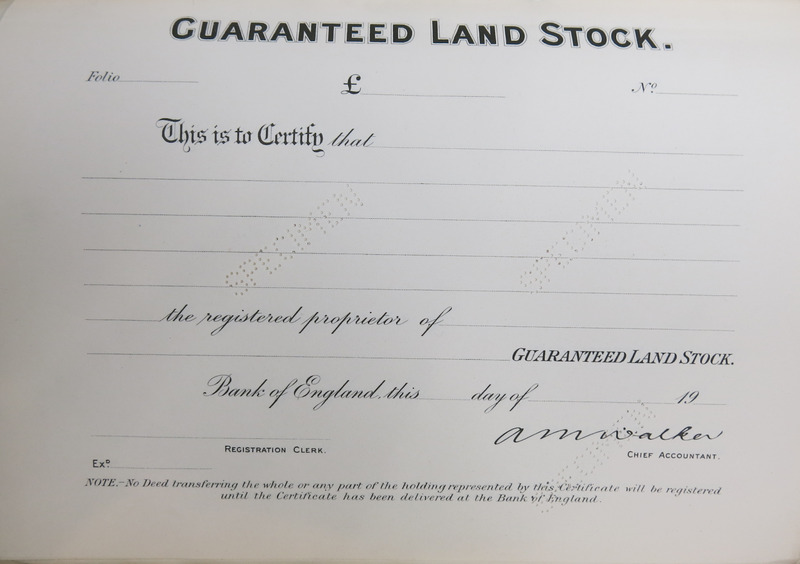 Before independence in 1922, all land bonds issued carried a UK government guarantee. After independence, the Irish government guaranteed new land bond issuance. The authors exploit this institutional structure to analyse market participants’ perception of the strength of the UK’s guarantees. Foley-Fisher and McLaughlin find persistent uncertainty about the value of the British government’s guarantee. This uncertainty lasted until 1932, when the Irish government refused to transfer payments on the land bonds to the British Treasury. The default forced the British government to make good on its guarantees. Demonstrating that the guarantees were sound removed the surrounding uncertainty. As a consequence, the yield spread on the pre-independence land bonds fell significantly. The main lesson is that uncertainty about fiscal responsibility can persist for a long time after independence has been declared. Even with sovereign guarantees, market participants may expect compensation for the uncertainty in the form of higher yields. This compensation may, in turn, raise the cost of borrowing, as can be seen from the above graph. What is the causal effect of early-life mortality on fertility? Recent research by Philipp Ager, Casper W. Hansen and Peter S. Jensen sheds new light on this question by testing how the introduction of vaccination in Sweden at the end of 1801 affected early life mortality and fertility at the parish level. 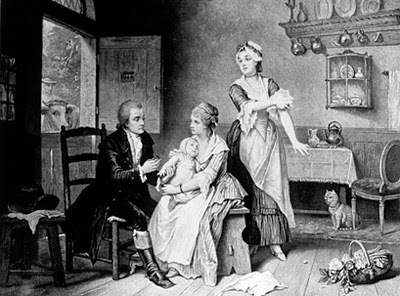 Edward Jenner (1749-1823), father of vaccination uses cowpox vaccine to inoculate children against smallpox. During the 18th century smallpox was a severe disease in Sweden that wiped out around 10 percent of the population; among them many infants. 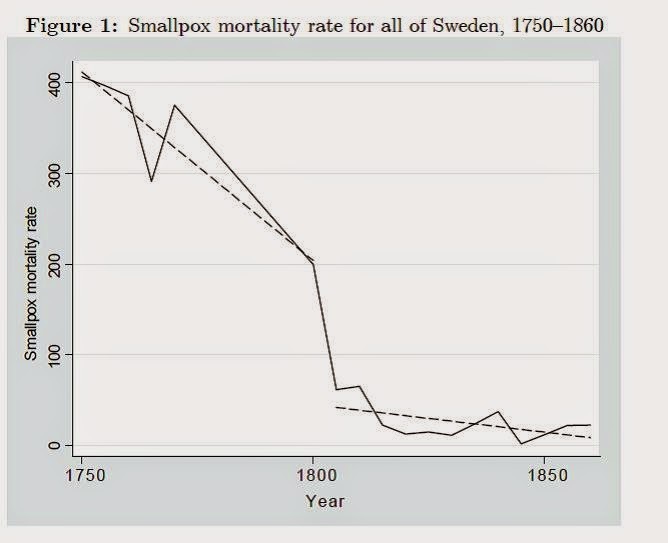 When vaccination reached Sweden, smallpox mortality dropped remarkably (see Figure 1), in particular, infants, who had the highest mortalities before vaccination, experienced the largest decline (see Table 1). In line with the historical narrative, Ager, Hansen and Jensen first show that parishes in counties with higher levels of smallpox mortality prior to the introduction of vaccination indeed experienced a greater decline in infant mortality afterwards. Based on this finding, the authors argue that they can identify the causal effect of early-life mortality on fertility. They construct an instrumental variable for early-life mortality where they exploit cross-sectional differences in pre-vaccination smallpox mortality (before 1801) along with the time variation arising from the introduction of the smallpox vaccine. Their instrumental variable estimate reveals that the vaccination-induced decline in early-life mortality lowered the birth rate, while the number of surviving children and population growth remained largely unaffected. Ager, Hansen and Jensen’s conclusion is that the decline in early-life mortality cannot be considered as a major determinant of the onset of Sweden's fertility decline during the 19th century. Is a lack of domestic energy resources necessarily a limiting factor to growth, as suggested for example by the work of Robert C. Allen? A new EHES Working Paper argues that this does not have to be the case using a case study of Denmark. 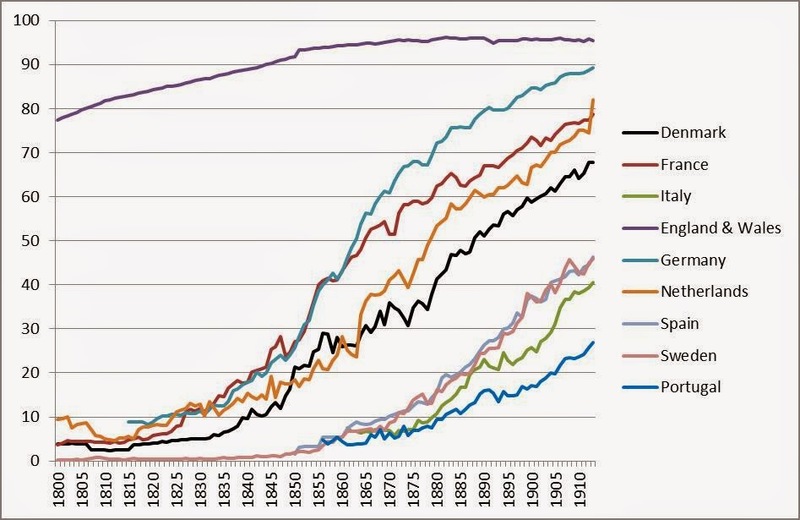 Denmark had historically next to no domestic energy resources, but the authors argue that Denmark’s take off at the end of the nineteenth century was in fact relatively energy dependent, which they document by presenting new historical energy accounts for the years 1800-1913. They then relate this to Denmark’s well-known agricultural transformation and development through the dairy industry. 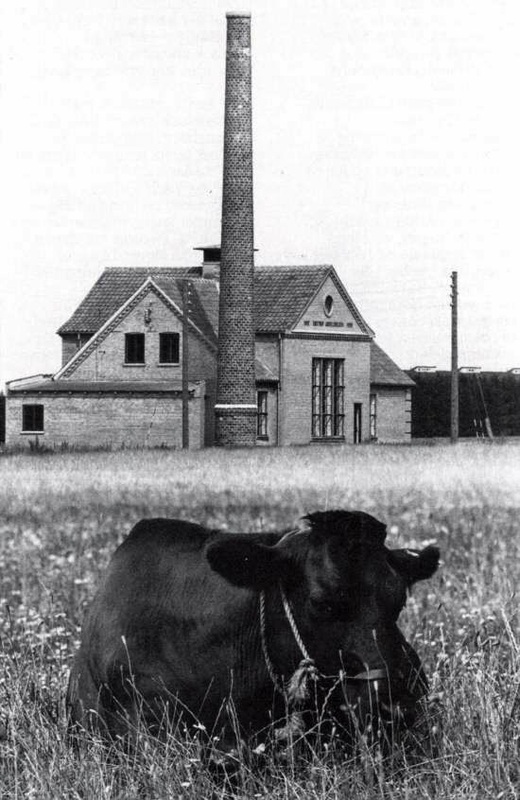 The Danish cooperative creameries, which spread throughout the country over the last two decades of the nineteenth century, were dependent on coal – a point which has not been stressed before in the literature. Although Denmark had next to no domestic coal deposits, they demonstrate that her geography allowed cheap availability throughout the country through imports. Thus, Denmark might be seen as the exception that proves the rule: although modern energy forms are important for growth, domestic energy resources are not necessary, as long as it is possible to import them cheaply from elsewhere. 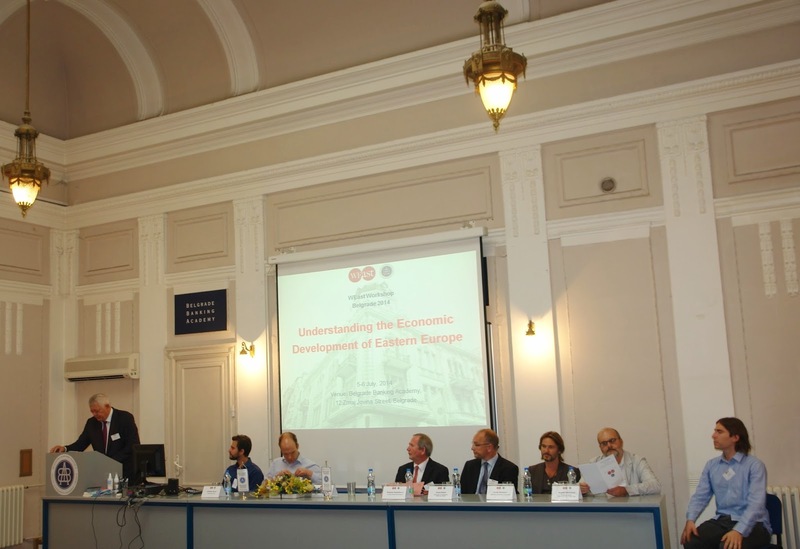 The WEast Economic History Workshop titled "Understanding the Economic Development of Eastern Europe" took place in Belgrade on the 5th and 6th July. 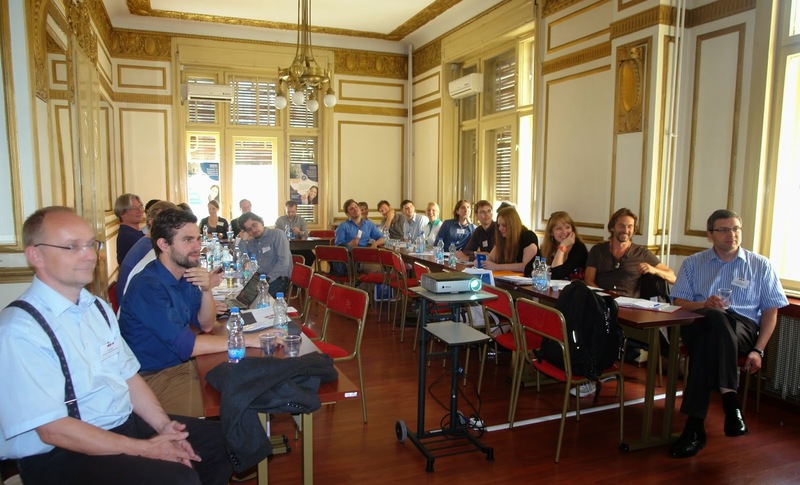 The Belgrade WEast Workshop was organised by Jacob Weisdorf, Mikolaj Malinowski, Matthias Morys, Stefan Nikolić and the Belgrade Banking Academy. The purpose of WEast Workshops is to foster knowledge transfer and collaboration between economic historians and economists, with shared interest in the region of CESEE, representing both western and eastern universities and research centres. Over the duration of two days, fascinating lectures were given by Stephen Broadberry (LSE) and Branko Milanović (Graduate center, CUNY), 15 papers were presented in 5 sessions, with participants coming from 17 different institutions located in 11 different countries (both in the "West" and "East"). The Workshop was held just in the center of the Serbian capital, in an elegant ambience of a building erected in 1911, in the Secessionist style. Belgrade proved to be an excellent host, not least because it managed to nourish the participants with beautiful sunny weather so that they can explore its sights in their spare time. The Workshop was opened by a keynote address by Stephen Broadberry. His lecture was titled "Accounting for the Great Divergence" and it set the tone for academic discourse in the sessions to follow. Given the nature of the workshop he put special emphasis on explaining Europe’s Little Divergence. He acknowledged recent contributions that incorporate Eastern Europe into the debate. The first of the three academic sessions on the first day started with Ralph Hippe (LSE) and Joerg Baten (University of Tubingen) who found that for less industrialised countries in 19th century Europe there was a substantial negative effect of land inequality on human capital. 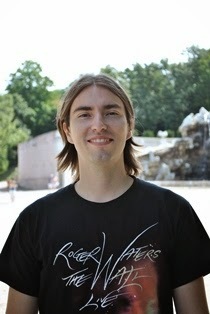 Thereafter, Elena Korchmina and Ilya Voskoboynikov (both affiliated with National Research University Higher School of Economics) argued that noblemen-veterans of Napoleonic wars (1812-1814) influenced the quality of government in the Russian Ryazan province by changing the existing model of elections. Finally, Jelena Rafailović (Institute for Recent History of Serbia), analysed innovative activity in interwar Yugoslavia using an extensive data set on patent statistics. After a lunch break with traditional Serbian food and sweets, the second session started with Matthias Morys (University of York) presenting his joint paper written with Martin Ivanov (Bulgarian Academy of Sciences). Using dynamic factor analysis the authors find a steadily increasing synchronisation of business cycles in five SEE counties with a pan-European business cycle before 1913 and the emergence of a regional business cycle in the interwar period. Next, Elena Korchmina presented her joint work with Andrei Markevich (New Economics School Moscow) in which they analyse the link between poll tax collection in XVIII century Russia (Ryazan province) and modern state formation. The session concluded with a topic quite connected to tax collection, albeit in the 20th century. 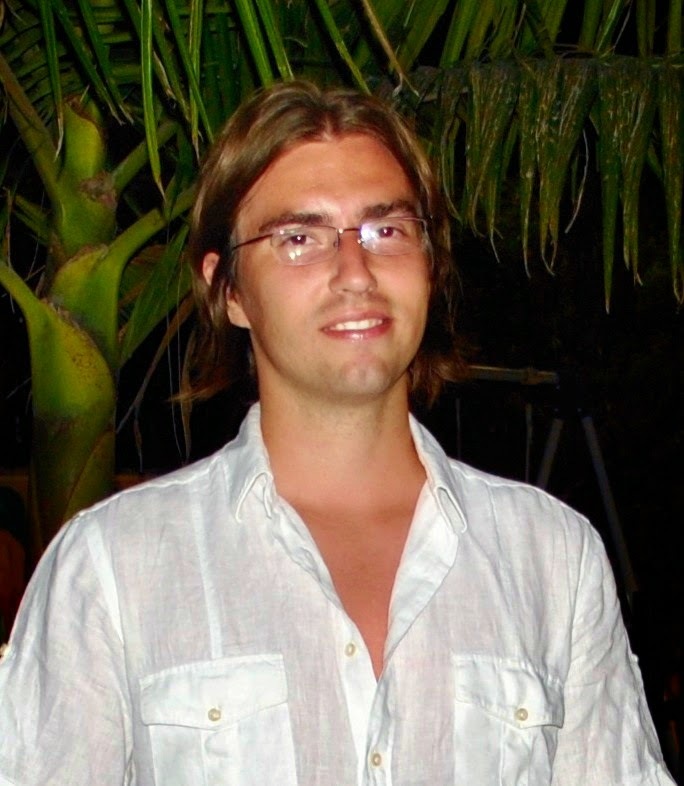 Relying on income tax data, Filip Novokmet (Paris School of Economics) showed that for the interwar period concentration of income at the top of the income distribution was much more pronounced in Czechoslovakia than in Bulgaria. The final session of the day focused on former Yugoslavia and its successor states. Milan Deskar-Škrbić (Erste & Steiermarkische Bank) presented a paper co-authored with Jurica Zrnc (Croatian National Bank) and Ivo Bićanić (Faculty of Business and Economics, Zagreb), in which they analyse points of convergence and discontinuity in the Yugoslav economy on a regional level for the period 1950-1990. Dora Tuđa (University of Tilburg) presented her joint work with Ivo Bićanić, on long term estimates of Croatian GDP data and a critique of them, to which Branko Milanović (as an author of one of the series) could provide substantial feedback. The session concluded with Leonard Kukić (LSE) presenting his research on the contribution of misallocation of resources between sectors to Yugoslav regional income disparities, in the post-WWII period. After an eventful first day of work, all the participants were invited for a relaxing and well deserved dinner. Branko Milanović started the second day of the Workshop with a lecture titled “Between Kuznets and Piketty: How to understand inequality changes in the last 200 years”. His main argument was that in the long term there are waves of upswings and downswings in inequality - which he proposed to be called the “Kuznets’ Waves” - and that we are now part of a second such wave driven by the current industrial revolution. In contrast to the current “industrial revolution”, the first session of the day dealt with industrialisation in the East in the 19th and 20th century. 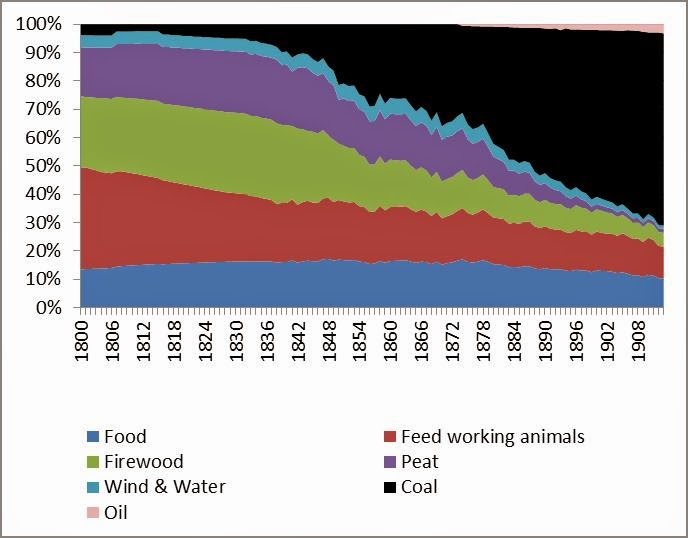 Employing new time‐series of energy use and steam engines for the Czech Republic (1830-1873) and using tools of Economic Geography, Hana Nielsen (Lund University) studied the role of coal in Czech industrialisation and made a Gerschenkron-like argument, that despite the use of coal starting relatively late, eventually a fast transition towards its use was able to compensate for the delay. 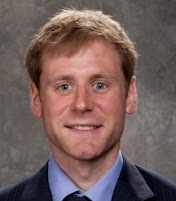 Stefan Nikolić (University of York) exploited regional variation in his analysis of the determinants of industrial location. Relying on a new panel data set, he argued that factor endowments were clearly more important than New Economic Geography factors in attracting industry in interwar Yugoslavia. Finally, Hrvoje Ratkajec (University of Primorska, Koper) combined Economic Geography with Business History, to analyse the industrial and trade connections between the area of Northeast Adriatic (with centre in Triest) and other Slovenian lands in the period 1900-1930, focusing on the impacts of the First World War on these connections. The last but not least session examined the origins and consequences of Polish partitions. Mikolaj Malinowski (Utrecht University / Humboldt University) demonstrated that collapse of the central institutions in Poland in the 17th and 18th century brought about market disintegration and economic stagnation that set the stage for the disappearance of the country in 1795. Piotr Korys and Maciej Tyminski (both affiliated with University of Warsaw) presented a part of their ongoing project on the reconstruction of GDP of Polish lands during the partition period and documented the evolution and economy structure in the late 19th and early 20th century in different partition territories. The partition also played a role in the final paper of the workshop in which Pawel Bukowski (CEU) convincingly argued that the partition of Poland by the Russian, Prussian and Habsburg Empires, has had long lasting effects on the educational performance of Polish students, depending on the educational tradition and attitude towards the dominating empire. The participants in all the sessions were very much inspired to comment and ask questions regarding the papers being presented. Furthermore, a fun thing to mention is that when Branko Milanović “tweeted” Pawel Bukowski’s aforementioned results, questions for the presenter were coming even from the "Twittersphere". Pawel gladly responded, so in a very modern way the workshop echoed far beyond Belgrade even before it was over. For all the above stated, we can conclude that the Belgrade WEast Workshop was a great success. For this reason the WEast team is very optimistic about the forthcoming WEast Workshops. You can find more information about the WEast initiative and its activities at http://weast-initiative.blogspot.de/ .